Six-pin Flash device -- exclusive. THE world's smallest microcontroller, the PIC10F206 chip created by Microchip Technology, is now available from Farnell InOne in an exclusive bundle starter kit. These 6-pin Flash devices provide solutions for design engineers in many markets not previously served by microcontrollers, such as easy bug fixes for ASIC and printed circuit board designs, replacing standard logic and timing components, or traditional mechanical timers and switches. 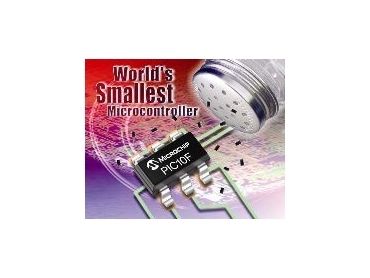 Microchip's PICmicro MCU family has long offered solutions for the broadest range of microcontroller applications. With the development of these revolutionary 8-bit Flash devices in 6-pin packages, the possibilities for non-traditional microcontroller uses can be realised, limited only by a designer's imagination. The bundle starter kit includes five samples of the PIC10F206 chip, as well as the PICkit 1 Flash starter kit, and the PIC10F adapter conversion kit. In addition to the exclusive offer, for a limited period*, Farnell InOne customers will receive a special discounted price - place an order today while stocks last and start designing with Microchip and Farnell InOne. *Offer available until December 31, 2004.